Woodturning is a relaxing, satisfying, creative hobby; producing three-dimensional pieces quickly while working in two; working with one of the most natural, tactile and beautiful materials on earth. Every piece you make can be different, depending on your whims and the material available. Being at one with the lathe; sharing you work with family and fellow woodturners. Time does not matter when you can get away from the cares of the world in a workshop which you can call your own. The only thing that matters is that you enjoy turning. Many recreational woodturners produce extremely good pieces, and may well be deservedly recognised as a good turner by friends and local woodturners, even good enough to get a mention or a photograph in a woodworking magazine. But then, if you want to 'make your mark' on the woodturning world, be identified or recognized as a great woodturner, on a national or international level, then the comforts of woodturning as a hobby are out of the window and you are in a very different game and a mindset to match. It's not enough to produce one, or even a few good pieces, one of anything is an oddity and it's only going to be seen by a few people; make 20 in the same form and it could start to become a style. Make hundreds and they could become collectors' pieces. And that's important - they must sell. Looking at the photographs within this article, can you identify the turners without reading the captions? If you didn't recognise the maker of the bird bowl then I'm in trouble. "What do these woodturners have in common?" The answer is that their work is their trademark; they all have styles/techniques that they pioneered, and if you see any of their work it is recognisable without looking on the base to see the signature. 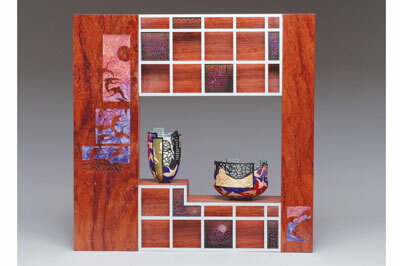 All their pieces might be different - not identical - but they are all similar and within a very focused design. Having made their mark they continue to develop further and some of them branch out with new ideas, creating new series of work beyond the realm of woodturning. What appears to have happened is that each of them found an area (theme) of woodturning, either by accident or design that fascinates them. Then working on this, they honed their turning skills, refined shapes and textures, creating resolved designs which have eventually become identifiable with them. If you wish to follow a similar path, focus you energies on the area of woodturning that excites you the most and where you can see potential for development. Experimentation is the key - try things out on the lathe: shapes, timbers, techniques, tools, where the experimentation is the outcome, not the piece. Have fun, take some risks - not life threatening ones - and it is even better if there isn't a piece at the end, as what you have done is to remove the preciousness of the wood which gives you the freedom to try anything. Non-turning elements and techniques also play a big part in the new work that is being produced, so make use of other equipment around you. Jim Partridge used a welding torch, which was in the college workshop, for his first experiments in scorching wood. See mistakes as opportunities. Solutions are often a stimulus towards a new direction. Development is not just in the workshop; make sketches as these can help you resolve ideas quickly. In doing all this you will build your skills, ideas, designs and eventually produce work that is easily recognisable as having been made by the same woodturner, which is a big step towards the end goal. To start with, they may not be entirely original in design, though using other peoples' work for inspiration is a natural process and a good starting point, but again, limit your mentors to keep on a narrow path. My mentor was Richard Raffan, who I met in 1981. The woodturning world was a very different place back then: turning green wood was very new and Richard, along with Jim Partridge were the first in this field in the UK. Working in a narrow area of woodturning it becomes evident which tools, chucks, equipment and procedures are needed to make your designs. 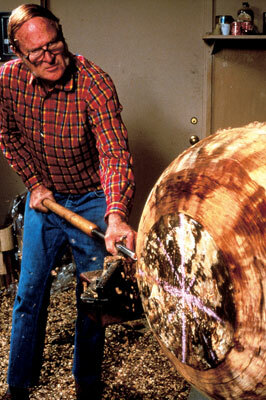 David Ellsworth developed the first hollowing tools back in 1975; Lindquist took to chainsaws as turning tools; Ed Moulthrop stored his heavy logs on higher ground outside his workshop so they could then easily be rolled in to the workshop, a faceplate fitted, then lifted with block and tackle and attached to the lathe. If I remember rightly, some of his tools were up to 10ft long. When you have resolved designs, built a body of work, then comes the biggest hurdle - marketing. 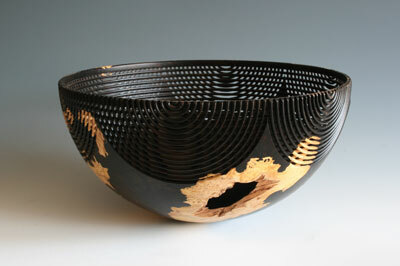 Have professional photographs taken of your work: a few people see one bowl, a photograph can be seen by thousands. The quality of the photographs is important as they reflect your quality as a 'marketable craftsman' as much as the work. 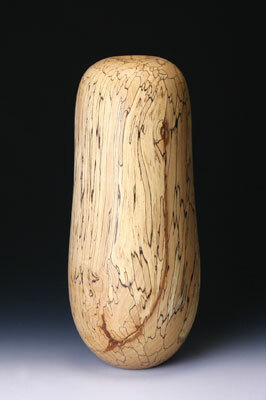 Research which galleries show/sell woodturning. Make appointments; make a professional presentation of your work - don't show them pictures on your mobile phone. If the galleries don't bite, don't go around blaming their poor judgement and lack of taste, look to yourself and your products to find the reasons. The galleries have a living to make, they have set their benchmark, they know their market, and those galleries are probably the wrong ones for you - at the moment. Once you have your first exhibition arranged, get as much publicity as possible. It is important to get it out there quickly to establish the work as yours. Remember at this point, your target audience is the public at large, not other woodturners. 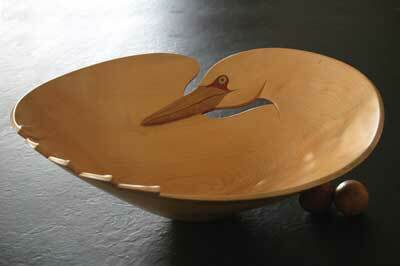 But one thing you can be sure of is that other woodturners will be looking closely at what you are doing. Much of this might sound like just common sense, but it is surprising how common sense often goes out the window when dealing with your own work. Getting your first exhibition in a gallery is a great feeling. You have started to create an image of yourself as a woodturner. For your next exhibition, what the galleries will want is more of the same. Good Luck. Mark was born in Florida, USA. His education history includes studying photography, painting and sculpture, and Mark subsequently became an apprentice to a Zen Adherent potter. I saw Mark give an amazing demonstration at Arrowmont School of Arts & Crafts in 1985; it was quite a groundbreaking experience seeing a chainsaw used as a turning tool, though he had used it since the early '70s. 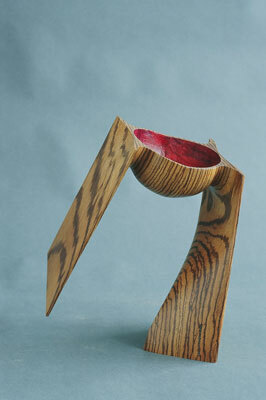 Mark was instrumental in setting up the woodturning programme at Arrowmont in the early '80s. David grew up in Philadelphia and Colorado, USA. 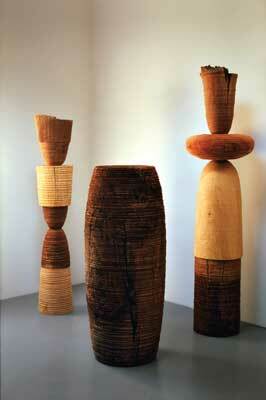 He then went on to complete a Masters degree in sculpture in 1973. Ellsworth pioneered the 'hollow form' and has just published his first book, Ellsworth on Woodturning, which gives a deep insight into David as a person. Ellsworth was also active in the formation of the American Association of Woodturners (AAW) in 1985 and was their first President. Stephen was born in England but later moved to Ontario, Canada. Here he studied at Rycotewood College and the Royal College of Art. Stephen set up his studio in 1971 and went on to spend a year as craftsman in residence at Melbourne State College, Australia, an account of which is documented in his book The Purpose of the Object. 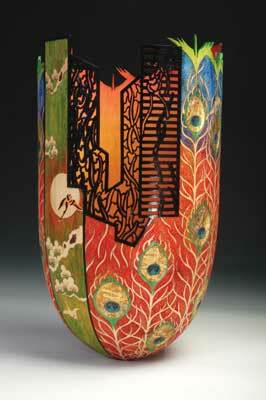 Hogbin turned on a large scale and evolved new forms by cutting turned pieces and reassembling them. 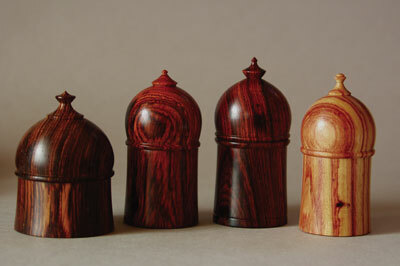 Ed, from Atlanta, Georgia, trained as an architect, so when he came to woodturning he worked on an architectural scale. He worked with selecting tulipwood trees that had been struck by lightning, which created interesting colours and marks in the wood, and then turning large vessels that would hold his grandchildren. Now, second and third generations, Phillip and Matt are maintaining a Moulthrop tradition. Born in Vietnam and now living in the USA, Binh's style is very much on the 'art' side of woodturning, using piercing and painting to reflect the far east culture and his Journey to the west, having escaped from Vietnam in 1978. Binh loves to bring the beauty of nature and hand-creation techniques together to create character and soul in a piece. River of Destiny is the title of his book about his life and work. Glenn, born in Ireland, embarked upon an apprenticeship as a cabinetmaker in Carlow, Dublin where he learnt many new skills. 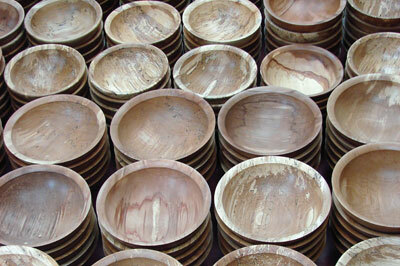 Glenn works at the production end of woodturning, producing 1,500 functional bowls per year. I include Glenn as he produces three sizes of identical bowls and is a retailers' dream; they get consistent design, size, pricing and delivery. Al graduated from the State University of New York with a Bachelor of Arts degree and made his first fluted bowl in 1981, inspired by a photo of a Chinese Song Dynasty ceramic fluted bowl. A fluted butternut bowl made in 1987 was recently acquired by the Victoria and Albert Museum in London.